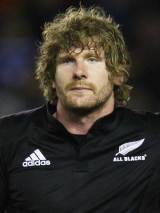 New Zealand flanker Adam Thomson made his provincial debut for Otago against Waikato in the 2004 National Provincial Championship. While Thomson's input was limited to four games that season, he steadily built a reputation with Otago and returned stronger the following season. His Super 14 debut came in 2006, when he played three games from the bench for the Highlanders. Despite a strong showing for Otago in the 2006 NPC, Thomson was overlooked for selection in the 2007 Super 14. Thomson secured a return to Super 14 action in 2008, and despite beginning the season as a replacement he soon established a place for himself as one of the region's first-choice flankers. Thomson's strong Super 14 season led to a call up to the All Blacks squad for the visits of Ireland and England in the summer of 2008. Thomson had already represented New Zealand at Schoolboy, Under 19 and Under 21 level before making his full-international bow as a replacement against Ireland, subsequently starting the next Test against England. Thomson was also selected for the All Blacks Tri-Nations squad, starting against South Africa during the opening rounds and making replacement appearances against the Wallabies, including in Hong Kong. Thomson made one appearance on New Zealand's Grand Slam tour, starting against Scotland on the openside flank. In December 2008 Thomson was ordered before magistrates after an alleged assault on a woman in Havelock North. He was cleared of all charges in June 2009 after being named in the All Blacks squad to face Italy and France in the June Tests. After sitting out the 2010 tour to the northern hemisphere through injury, Thomson impressed throughout the 2011 Super Rugby season for the Highlanders. He was well established in the All Blacks side which failed to retain the Tri-Nations in 2011 and was named in the 30-man squad for the World Cup. Thomson was an injury doubt going into the tournament with his elbow troubling him. But he recovered from the injury to make two starts against Japan and France in the pool stages before reverting to the bench for the latter stages of the tournament.